A great day. We walked about 17 miles with incredible elevations. We were above the clouds. The scenery was beyond what I imagined. What a challenge to hike over the mountains but what a reward to conclude with the Song of Roland. There was a pilgrim Mass. After the post communion prayer they invited the pilgrims to come to the altar for a blessing. Then they dimmed the lights and focused on Mary and sang the Salve Regina. 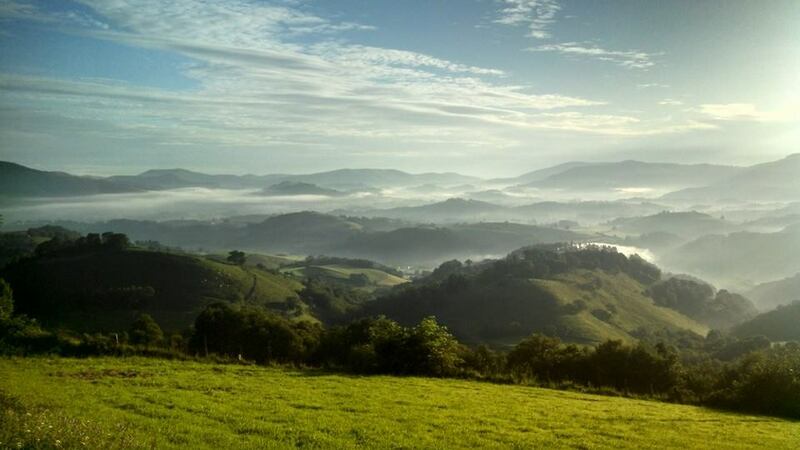 This entry was posted in Camino, Pilgrimage and tagged Camino, Mass, Roland, Roncesvalles on August 27, 2014 by frjfkauffmann. On Sunday, June 22nd, after the 11 am Mass, there will be our annual Corpus Christi procession when we will process the Most Blessed Sacrament through the neighborhood to affirm the faith of the ancient Christian church, that is the real and substantial presence of the Lord in the Blessed Sacrament. The procession with conclude with Solemn Benediction of the Blessed Sacrament. This is a wonderful opportunity to extend an invitation to those you know who would like to join us in this public manifestation of the faith. The parish joins with Catholics throughout the world in a procession that affirms our ancient faith. On Thursday the Blessed Sacrament was carried in procession in Rome, and our Holy Father, Pope Francis held Mass and led in Adoration. Our procession will certainly not be of the magnitude of the procession in Rome, however our procession will be an expression of the faith of a people who believed in the words of the Preface that “bathed in the sweetness of your grace, we may pass over to the heavenly realities here foreshadowed.” As we prepare to celebrate this Sunday, may the words of the post communion prayer be on our lips: Grant O Lord, we pray, that we may delight for all eternity in that share in your divine life, which is foreshadowed in the present age by reception of your precious Body and Blood Who live and reign forever. One of the beautiful Sanctuary windows in Saint Benedict Catholic Church, Richmond, Virginia. Corpus Christi Procession, June 2014. The monstrance is carried under the canopy, escorted by the Knights and Ladies of the Order of the Holy Sepulchre. New Liturgical Movement included this photograph among its photoposts of Corpus Christi processions around the world, Part 1 and Part 2. This entry was posted in Faith, Feasts, Witnessing and tagged Adoration, Blessed Sacrament, Corpus Christi, Mass on June 20, 2014 by frjfkauffmann.